Your Own Lucrative Mailing List! 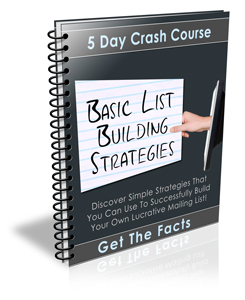 Inside The Basic List Building Strategies Five-Day Crash Course you will learn the basic information that you need to build your own lucrative mailing list and use it to effectively market and promote your business, products and services. You'll also discover some simple tactics and strategies that will help you increase all of your list building results. You'll Discover Basic Strategies That You Can Use To Build Your Own Lucrative Mailing List, So That You Can Use Email Marketing To Effectively Promote Your Business, Products And Services! Inside each lesson, you will receive easy to understand information that will help you understand exactly what a responsive mailing list can do for your business along with basic, but extremely effective methods that you can use to quickly and easily build your own lucrative list. You will also discover the importance of building a good, solid reputation with your subscribers, so that they will be excited to open up your emails and purchase whatever you have to offer! This course is specifically designed with beginners in mind, so even if you've never built a mailing list before, you will discover how to quickly attract new leads and collect email addresses like a pro! strategies that you can use to build your own lucrative mailing list! Exactly what building a mailing list can do for your business along with two basic, yet extremely effective strategies that you can start using right away. Some simple methods that you can use effectively build your mailing list with article marketing. a responsive mailing list faster than you ever thought possible. Different ways that you can quickly build your mailing list and convert your new found subscribers into long time customers just by joining giveaway events. Simple strategies that will help you maximize your profits while building your list by using simple follow up emails and one time offers. And that's just the beginning. Once you sign up for the "Basic List Building Strategies" Crash Course you will have access to great information in every lesson that will give you a better understanding of what building a mailing list can do for your business and how you can maximize your results by employing basic list building strategies. you'll start receiving your crash course lessons right away!